Ethiopia | Untamed Borders - Adventure travel..
History soaked Ethiopia. Home of the Queen of Sheba, where fact and legend blur. The second oldest Christian nation in the world, reputed to be the home of the Ark of the Covenant. In the long and disturbed history of the African continent Ethiopia remains the only country that has never been colonised. A journey through Ethiopia offers a unique and distinct experience. Ethiopia is home to a truly diverse landscape and peoples. The otherworldly volcanic landscape of the inhospitable Danakil Depression, the lush peaks of the Simien Mountains and the bleak deserts bordering Somalia are populated by a range of ethnic groups. Christian, Muslim and Pagan rituals and practices blur providing Ethiopia with unique cuisines and cultures. Whether it is visiting a Jazz club in Addis Ababa, feeding wild hyenas outside the walls of Harar or watching the salt caravans of the Afar people, Ethiopia will stimulate even the most jaded African adventurer. 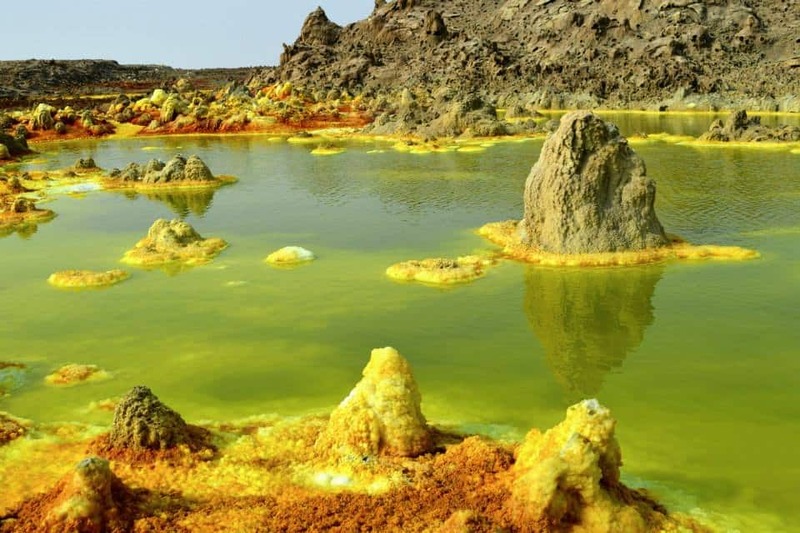 In the far north east of Ethiopia is the Danakil Depression. The region is at times over one hundred metres below sea level and the scenery can best be described as otherworldly. An inhospitable landscape of sulphur springs, acid pools and colourful rock formations. 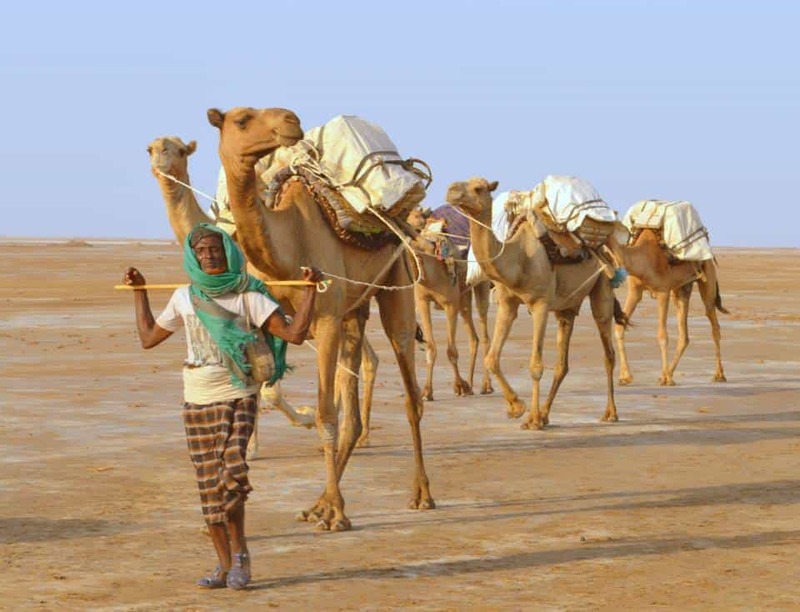 These harsh conditions are home to the Afar people who mine salt and make the Danakil Depression the hottest inhabited place on earth. The highlight for many of our guests is camping on the rim of Erta Ale and sleeping within spitting distance of the boiling lava of the world’s only permanent lava lake. An experience you will never forget. Harar sits at a crossroads between the Christian kingdoms of Ethiopia and the Islamic coastal regions of the Somali tribes. Considered by some to be the 4th holiest city in Islam, the old city is famed for its medieval townhouses and has 82 mosques including three built in the 10th century. The walls surrounding the sacred city of Harar were built between the 13th and 16th centuries and it is a great joy to simply get lost in its winding streets. African and Islamic traditions combine creating a particular unique character. One of Harar’s more unusual traditions is the nightly feeding of wild Hyenas that wander the streets. Ethiopia is a place where history and myth blur together and nowhere is this more prevalent than in the capital of the great classical Axumite Empire. Believed to be founded by the Queen of Sheba and the final resting place of the Ark of the Covenant, Axum is a UNESCO world heritage site that is still being explored and excavated. Each year throwing up new treasures. Highlights of Axum include the Axum Stelae Fields, where 120 stelae (giant granite pillars) are found, dating back to around 300-500 AD. Like the Pyramids in Egypt they were built by ancient rulers to mark their achievements so they would be remembered after their death. 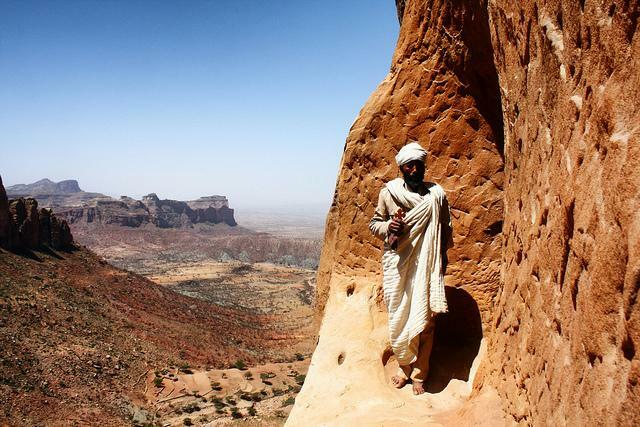 The northern Tigray region is home to some of the most outrageously located religious buildings on the planet. In caves, sometimes hundreds of metres above the ground, are churches carved out of the cliffs. Built between the 9th and 15th centuries they are the perfect place for the fit and adventurous culture seeker. Getting to them is half the fun as they are reached by strenuous and sometimes hair raising paths. It may be tough walking but the locations are truly spectacular. The eleven 12th century churches in the Lalibela area were built by the King of Ethiopia. He sought to recreate Jerusalem, and structured the churches’ landscape so the churches at Lalibela are clustered in two major groups. One representing the earthly Jerusalem and the other representing the heavenly Jerusalem. A UNESCO world heritage site, the churches are carved from volcanic red rock and are without doubt the most well known tourist attraction in Ethiopia. Time spent inside these structures epitomises Ethiopia’s distinct form of Christianity and spiritualism. Ethiopia offers an almost endless stream of adventures. The Simien and Bale mountains offer some of Africa’s best high altitude trekking. The Omo Valley is a treasure trove of pagan tribal groups. The Castles of Gonder tell of an ancient African Kingdom. Just contact us if you want to delve further into this beguiling nation. We do organise tailored trips in this fascinating region as well, please get in touch for more details.